For more than forty years, Gianni Vattimo, one of Europe's most important and influential philosophers, has been a leading participant in the postwar turn that has brought Nietzsche back to the center of philosophical enquiry. In this collection of his essays on the subject, which is a dialogue both with Nietzsche and with the Nietzschean tradition, Vattimo explores the German philosopher's most important works and discusses his views on the "Ubermensch," time, history, truth, hermeneutics, ethics, and aesthetics. He also presents a different, more "Italian" Nietzsche, one that diverges from German and French characterizations. Many contemporary French and poststructuralist philosophers offer literary or aesthetic readings of Nietzsche's work that downplay its political import. Shaped by the revolutionary tradition of 1968, Vattimo's interpretations take Nietzsche seriously as a political philosopher and argue for and defend his relevance to projects for social and political change. He emphasizes the hermeneutic aspect of Nietzsche's philosophy, characterizing the Nietzschean project as a political hermeneutics. Vattimo also grapples with Heidegger, a philosopher who has had a profound influence on the interpretation and understanding of Nietzsche. Vattimo examines Heidegger's philosophy through its complex relationship to Nietzsche's, and he produces a Heideggerian understanding of Nietzsche that paradoxically goes against Heidegger's own readings of Nietzsche's work. Heidegger believed Nietzsche was the ultimate metaphysician; Vattimo sees him as the founder of postmetaphysical philosophy. Throughout these essays, Vattimo draws on and quotes extensively from fragments in Nietzsche's notebooks, many of which have never before been translated into English. His writing is clear, elegant, and accessible, and, for the first time, Vattimo's own intellectual developments, shifts, and continuities can be clearly discerned. 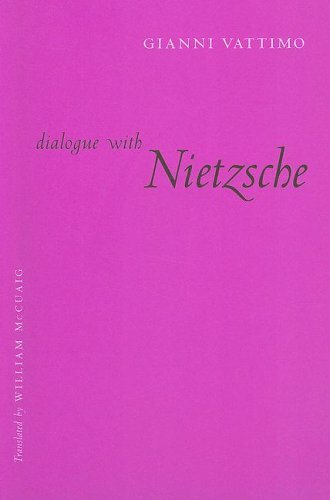 The loyal testimony and unique perspective in "Dialogue with Nietzsche" makes a convincing case for another orientation in Nietzsche scholarship.